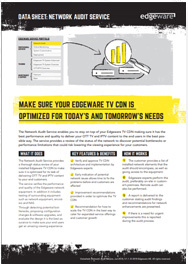 The Network Audit Service provides a thorough status review of your installed Edgeware TV CDN to make sure it is optimized for its task of delivering OTT TV and IPTV content to your end customers. The service verifies the CDN performance and quality of the Edgeware network equipment. In addition it includes testing of surrounding equipment such as network equipment, encoders and NAS. Through detecting potential bottlenecks, proposing configuration changes & software upgrades, and evaluate the design it is the best assurance to make sure your end users get an amazing viewing experience.